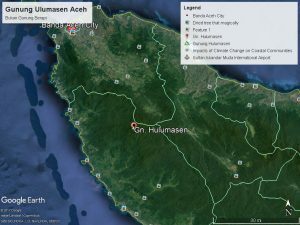 The Hulumasen forest is rich in biodiversity that makes this forest a high-value environmental service provider and is needed by the people of Aceh in the North through some environmental services such as: water supply providers, flood prevention and erosion, freshwater fisheries resources, power plants , carbon production, germplasm sources, non-timber forest product sources, pest control, science resources, and tourism. In the Hulumasen area, it is known that the endangered flora and fauna of Sumatera is certain to still inhabit this area. Like tiger, Sun Bear, Tiger Dahan, Slow Loris, Sumatran Orangutan, Siamang, Kedih or Reungkah, Sumatran Goat, hornbill boards, big kuau and Sumatran elephants.